1. Write at least five days per week, including at least one writing sprint each week. Yes on the days. 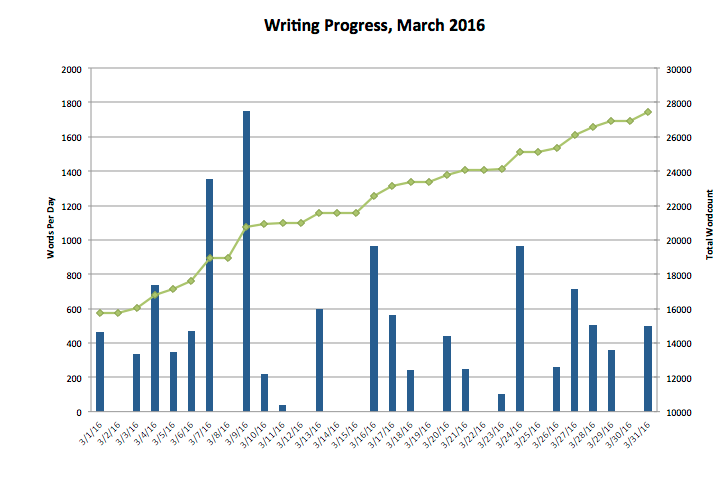 I didn't do a writing sprint as such each week, but I felt like I did a reasonable job of sustained writing. 2. Complete and publish fic for Wintersend exchange. Success, and reveals have now happened! I wrote a bit of light post-game Merrill/Isabela/f!Hawke, posted to AO3. I'll do a real crosspost soon. 3. Crosspost oustanding fic from Tumblr, fandom_stocking, and Final Fantasy Kiss Battle to AO3. Also complete. I want to crosspost some of those to Tumblr as well, which I'll get on this month. 4. Pull one old WIP out of storage and finish it (or make enough progress that it can be finished in April). I worked some on the Hawke in DAI fic, but I'm not convinced I'm feeling that one -- I have several ideas for it, and am in love with none of them. I also thought hard about the Alice/PotC crossover, but I'm pretty sure I need to watch at least some of the movies again to kickstart it. So instead, I worked on Wardens of Ivalice, and I'm going to move forward with that. 1. Report monthly wordcounts to getyourwordsout, and share WIP snippets with ushobwri at least once per month. Stretch goal: hit 150k pledge amount. I've been checking in at GYWO, but I think it's time to admit that I'm on hiatus from ushobwri. It was useful to me for a time, but it got to the point where checking in on it felt more like a chore than an incentive. I'll remain a member, because I do enjoy the community, and hope to get back to it someday. As for the stretch goal, it's not looking good, but it's early yet. I've picked up steam each month, and I have hope that this trend will continue. 2. Participate in at least one Big Bang and one fic exchange that I've never done before. I participated in Wintersend for the first time, and found it quite a satisfying experience. 3. Set aside one month to work on Wardens of Ivalice as my main project for that month. Not yet. See below. 5. Archive all flashfic to DW/AO3 on a quarterly basis. I actually did two rounds of this, one in January (although most of that was fic written in 2015) and once in March. 1. Write an average of six days per week, with at least one writing sprint, with a goal of getting down to less than 20% behind the annual pace. 2. Add at least double the current wordcount (currently around 7k) to the current draft of Wardens of Ivalice, part 2. And... that's it. I might work on other things, and I do intend to keep posting in my journal and write at least one full post for LB (I already have a topic in mind), but it's time for my Wardens of Ivalice month. Watch this space for meta thoughts and idea wrangling, and wish me luck. This entry is also posted at http://owlmoose.dreamwidth.org/741478.html. There are currently comments on DW. Current Music:Tori Amos - "China"